Mayor Joe Sinnott, lifelong resident of Erie, made a visit to the Elizabeth Lee Black School today. He joins 40+ other community members who have come to our school this week as volunteer readers to our students. 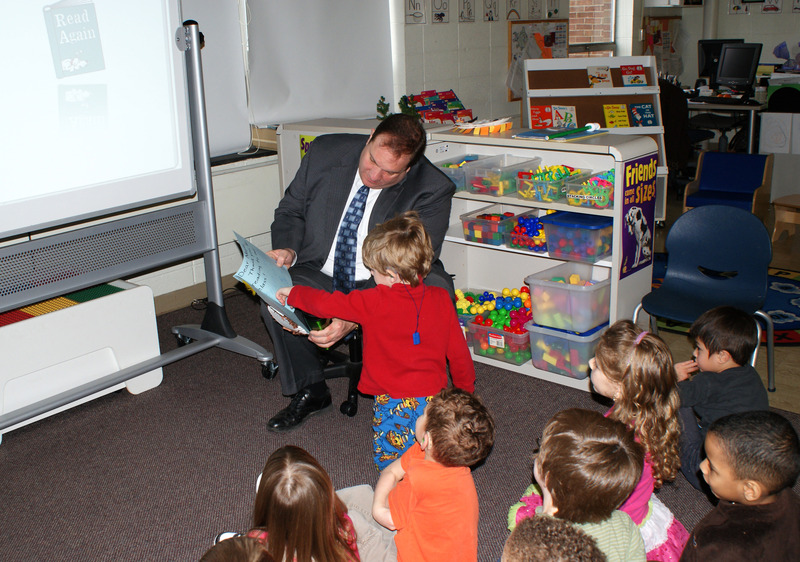 We are so honored that Mayor Sinnott joins us in our Seusstastical reading celebration! We asked the Mayor to share his thoughts about this experience with us. You have been a volunteer reader before. What do you enjoy most about reading to the children? I enjoy seeing their reactions to the rhymes and especially appreciate when the children join in with the rhyming. What book did you read this year? When you think of Dr. Seuss, what book first comes to mind? Which of the Dr. Seuss books is your favorite as a child and/or as an adult? I remember having “Green Eggs and Ham” read to me as a child and still appreciate the message, reminding us to try new things. What do you think Dr. Seuss was able to capture and share that brings the fun out in each of us? There is something about Dr. Seuss that brings out the fun in all of us. The nonsensical rhymes and tongue twisters that Dr. Seuss created still manage to trip us up, even as adults. Children of all ages seem to enjoy the rhyming nature and illustrations. Reading has many benefits for our children. Studies have shown that reading to toddlers and preschoolers results in a higher aptitude for learning in general. Reading helps build and reinforce basic speech skills, as well as enhanced concentration and logical thinking skills. As a parent and/or educator, reading with your child or students is one of the most important things you can do to prepare them for academic excellence. This entry was posted in Uncategorized and tagged erie, read across ameria, reading. Bookmark the permalink.